Have you found an online vendor selling Virgin Gorda 1493 Spanish Heritage? Schönes Honiggelb mit Goldreflektionen im Glas, so wie ein Rum ohne Farbstoffe aussehen sollte. In der Nase hart und herb, Harz und Holz, Chili und dunkle Schokolade sind die eine Seite. Die liebliche Seite gibt's auch, Blumen und kandierte Früchte, frisches Gras und etwas Rauch. Im Gaumen sehr elegant und weich, die Reinheit und Eleganz aus Barbados, die Tiefe und Schwere aus Trinidad, Der Funk und Groove aus Jamaica und die Ecken und Kanten aus Guatemala. Schokolade, frisch gepflückte Tropische Früchte und Karamell-Sahne Bonbons um nur einige zu nennen. Im Abgang lang und gehaltvoll, die Schokolade bleibt und es gesellen sich Aromen von Holz und Karamell dazu. Beautiful honey yellow with gold reflections in the glass, like a rum without colorants should look. In the nose hard and tart, resin and wood, chili and dark chocolate are the one side. The sweet side is also flowers and candied fruit, fresh grass and some smoke. On the palate very elegant and soft, the purity and elegance of Barbados, the depth and heaviness of Trinidad, the funk and groove of Jamaica and the corners and edges of Guatemala. Chocolate, freshly picked tropical fruits and caramel cream sweets to name but a few. The aftertaste is long and full-bodied, the chocolate remains and is accompanied by aromas of wood and caramel. 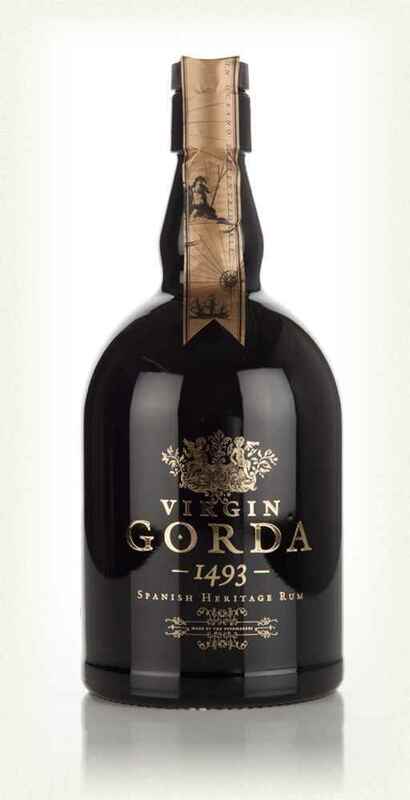 The Virgin Gorda 1493 Spanish Heritage rum bottle looks pretty nice but the color is very pale amber. No wonder they designed a blacked out bottle since this rum does not look very aged at all based on its pale light color. Smell test reveals a very dry rum. Taste test reveals surprisingly large bouquet of different rum inspirations. Very short end with hardly no burn. But unfortunately the reality is that this rum is very easily forgettable, and that is never a good thing.